I should really get out my vocabulary flash cards. Sven and I have been traveling through Mexico for four months. For four months I’ve been learning Spanish. A little longer, if you count the time I began to learn it on my own before we got here. 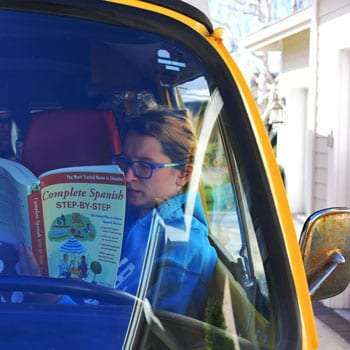 Back in California, I got a copy of Complete Spanish Step-by-Step in the mail. We had ordered it from Amazon to a friend’s house we knew we would be staying at. It was exciting. Back then, it meant that soon we would finally be heading to Latin America, that I would soon be surrounded by Spanish, and our trip would really come alive. We had been on the road, at the time, for seven months. Our goal is to drive from Alaska to Argentina, which means we had to get to Alaska first before we could start heading south. As amazing and unique as Alaska was, the months we spent in the States and Canada had left us lacking something. Having been born in Illinois, these countries were pretty much home for me. These cultures were pretty much home, and of course everything was in English. It’s untrue to say that we found these cultures boring, but there was simply something missing. For us, there is just nothing like wandering through a foreign culture, in a foreign language. And although we enjoyed our time in Anglo-North America, it just didn’t add that spiciness to travel that we anticipated in foreign Latin America. Back in California, I was enthusiastically wrapped up in my Spanish lessons (February 2017). Getting the book was exciting. Over the next few months, I began going through the chapters. I wanted to build myself a basis. I diligently made my vocabulary cards, learned to count past ten. I made myself a notebook, too, and collected vocabulary on my own, the things I thought were interesting. I made a page dedicated to Los Colores, and Verbos Regulares and Irregulares. 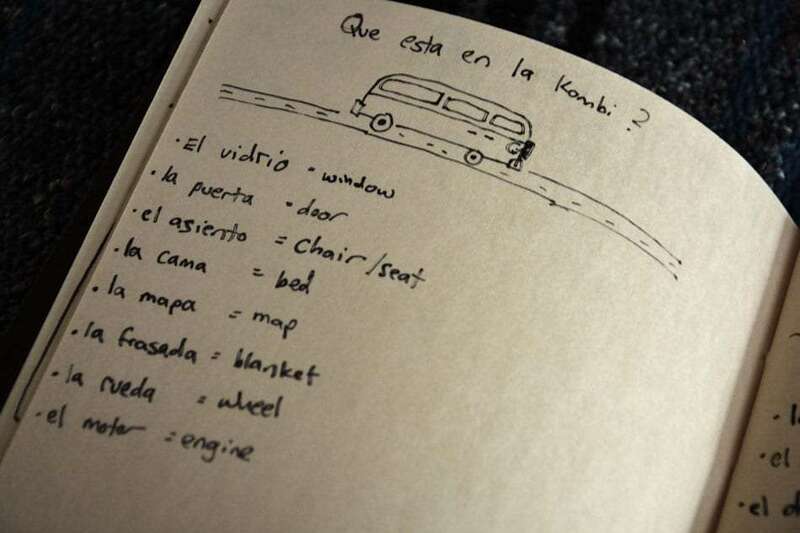 There was a page titled Que está en la Kombi? that gave me some of the everyday words that were unique to my situation, words that others may not need but that I imagined I would use all the time. I learned rueda (wheel), and ventana (window), motor (engine) and gabinetes (cabinets). I had collections of landscapes and weather, of directions and phrases with estar (to be). Even as I enthusiastically plotted through, I knew the real lessons were still to come. These were the ones I was really looking forward to, and the reason I was doing all of this vocabulary-collecting in the first place. I should be collecting now, actually. It’s not that often that I have the luxury of sitting in a nice, stationary apartment like I am today. Here I am enjoying extravagancies like running water, stable Internet and more than 80 square feet of space. I have time. We have recently changed up our travel schedule to spend more time out of our Bus, and to not spend all our time camping, hence the apartment. More than ever on this trip so far, I have time. I should go get my vocabulary cards. I should practice, flip them over and over, one by one, let the words somehow anchor themselves in my brain. Like I’ve done a million times so far. I should go get Spanish Step-by-Step off the shelf, and maybe do an exercise or two. Then I’ll have more vocabulary cards made with good intentions. Or I could just get some necessary writing done. Or maybe just open YouTube. I decide against the vocab cards for now and for opening my laptop. “I can do them this afternoon”, I tell myself, “I can concentrate then better anyways.” I try to let my brain’s cognitive dissonance function get away from me, because I know that I really should get out my flash cards. I know that I should want to get them out. And yet I don’t. Instead, I decide, again, to let them rot on the shelf today. But that feeling continues to gnaw away at me. Traveling in our Bus, we are so busy all the time, constantly on the move. There is always somewhere new to go, a job that needs to be completed, a camp spot that needs to be found for the night. And then, when we get there, there is food to be cooked (one-burner at a time on our camp stove), dishes to be done, something on our Bus that needs repairing. All this moving doesn’t leave a lot of extra time during the day to study flash cards and fill-in-the-blanks exercises about numbers in the current capítulo of my Spanish book. Which is why here, in an apartment, I should take advantage of the luxury and get some practicing done. 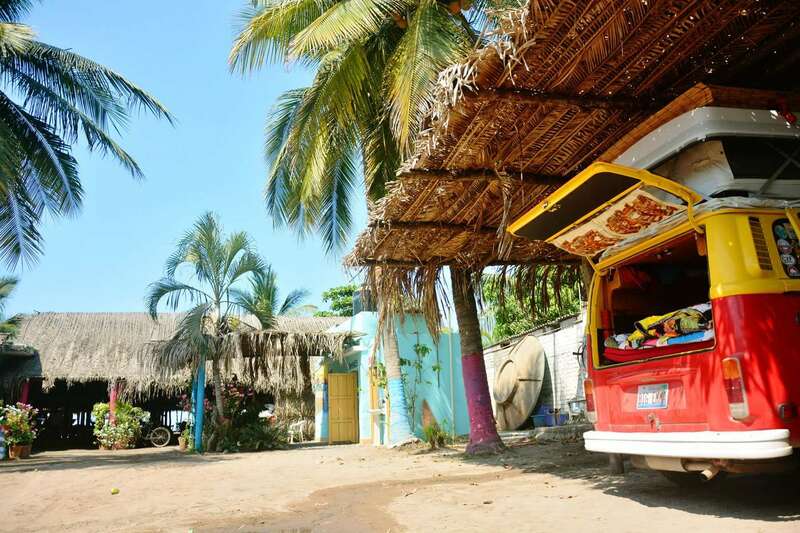 We usually spend our time camping and living in “Big Emma”, our Bus (San Blas, Mexico – May 2017). I was so enthusiastic at the beginning. Every new word was a tiny step closer to my goal. “By the time I get to Argentina”, I had promised myself, “I will have learned this language.” But my vocabulary cards were now collecting dust. Was I flaking? Had it all just been fancy talk? On the other hand, who cared if my flash cards were getting lonely? They were only supplementary learning materials. The real learning came through being here, in Mexico, talking to people. Emma outside a taqueria in Santiago, Baja California Sur, Mexico (April 2017). That was my true goal. Immerse myself in Spanish, at least to the best of my ability. Surround myself with it, all the time. Let Spanish fill my ears and my mouth and my brain until all it would produce is Español. I do believe in language classrooms, and that the book I had bought and the exercises I did were useful, but that wasn’t how I would learn. I knew, through past experience, that I would learn this language by using it, every day. These were the lessons that I was really looking forward to, after we crossed the border to the world of Spanish. I got what I was looking for. It started off slowly, but slow was okay. I have the gift and the curse that Sven is already fluent in Spanish, so I didn’t need to do the heavy lifting. 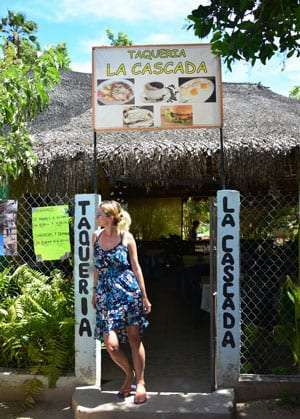 After a few days in Mexico, I was confident enough to walk up to the taco stand myself. “Buenos dias! Yo quiero dos tacos de pescado, por favor!” Two fish tacos, please. The taco lady smiles at me and begins to prepare the meal. “Flour or corn?” She asks me, in English. “No por aquí,” Not for here, I begin, “por….” my sentence drifts off to silence, as I realize I don’t have the word I need for my request. I make my fingers walk across the table. Exactly, I would like my tacos to go, please. “Disculpe, mi Español es muy mál, yo aprendo.” Sorry for my bad Spanish. I’m learning. It’s not a problem that my Spanish is bad, she’s understood me. Understanding. That was the important part, the part that I had been looking forward to. Not just to the hundreds of kind, empathetic Mexicans we would meet along the way, but to using what I knew. And not just using, but creatively using. Sure, I didn’t know all the words, but somehow I would figure it out. Language is about so much more than words or grammar. It is about communication. And there were so many tools in my communication toolbox. Mimics and gestures, pantomime and onomatopoeias and, hell, pen and paper drawings of comic buses featuring arrows and smiley faces if I really needed it. I didn’t have to rely on the smiley faces very often. My pre-Mexico preparation had done the trick, had given me that head start to speaking that I needed to truly immerse myself. Immersion has two sides to it: not only did I need to listen to my Spanish surroundings, I also needed to reproduce it to the best of my ability. 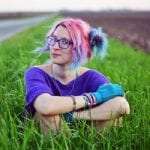 “The best of my ability” meant that I was often formulating half-sentences, misconjugating verbs, messing up genders and plural nouns and all sorts of stuff. I was fumbling through this new, complex, beautiful language. And every time I fumbled, I got a little better. Halfway down Baja California, I was able to have a haphazard discussion with a man on the side of the road about spare tires. We had both stopped to help a gringo driver with a flat, and now we were watching as he attempted to wrestle with his spare. Not only was the spare too small to match his remaining tires, the rim was also the wrong size and didn’t even fit on the studs of his car. I didn’t know the word for tire, or spare, or to change. But I did know the words rueda (wheel), extra, and rueda nueva (new wheel). That was the most magical tool in my toolbox: good-enough synonyms, simplifications, and descriptions of words I didn’t know using words that I did. This tool would get me through almost anything. Sure, I didn’t have all the words. But I didn’t need all the words. I could describe what I wanted to say using the words that I already had. They were never 100% correct, but I didn’t care. What I cared about was if I was being understood. It is incredible how well you can have a conversation with somebody with so little vocabulary at your disposal. It is exhilarating; the conversation with this señor about spare tires certainly was. Conversation continued to be invigorating. My limited knowledge was no reason to limit myself on conversation topics. Just the opposite: I wanted to be able to talk about any topic at all, whether I knew the correct words or not. That is how I would learn. I continued to practice. 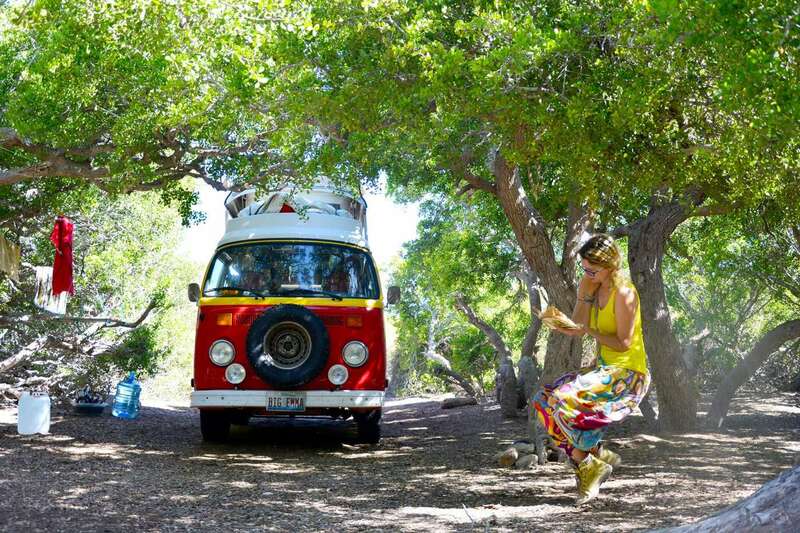 In southern Baja, I had a two-hour conversation with Sven and an older Mexican man, watching a bunch of yoga students from New York pass spliffs around a bonfire. In the same town, I spent three hours drinking cerveza with the caretakers of the house we had been invited to stay in, talking about politics and what it was like being a US-American in Mexico right now. During these conversations, Sven would simply talk to them. I would listen, and follow the topics as they wandered around different aspects of life. I would listen for the puzzle pieces of understanding to fall into place. When I had something to say, I would chime in, and between my Simple Spanish and Sven’s Simple-to-Normal Spanish translations, I would be understood. I never got every detail of these conversations, but I could always follow the topics. I knew what we were talking about, even if I didn’t always understand the details of what was being said. This trend continued. I loved learning Spanish. I was finally immersing myself in a foreign language and a foreign culture again after so many months in the USA. This was the environment I thrived in. We had a lot of conversations, Sven often acting as a go-between. But I could handle myself. Speaking Spanish didn’t scare me. I was at a level where, despite my lack of a broad vocabulary or mastery of grammar, I could hold my own in most normal situations. Every once and a while, I would notice Spanish Step-by-Step, looking lonely and forlorn on the shelf of our Bus, asking when I was going to play with it again. “Soon,” I said, “I’m pretty busy today. And besides,” I told it, “I’ve just had a conversation with those Mexicans over there sharing our camp spot. I’ve already practiced my Spanish for today, so I don’t need you.” I only felt slightly guilty. But I can’t, we just have to give it a go. And one of the strategies they tend to employ when faced with this situation is simply switching to English. In numerous conversations, I insist, “Yo quiero hablar Español, porque es bueno para apprender.” I want to speak in Spanish, it helps me learn. But after a series of “No entiendos” on my part, inglés it is. I give in, and let them talk to me in English. I can understand that they might not have the patience to explain to me what they want to say in Spanish until we all get old. All too often, I let them do this. “It’s because I don’t want to annoy them,” I tell myself. But I keep it a secret that it is also just less effort this way for me, too. Myself doesn’t need to know that. I walk into my room at the guesthouse in Guadalajara and notice my most current bundle of vocab cards has escaped its rubber band and exploded all over the floor. I gather them up, that guilty feeling rising slightly. “Man, now I’ll have to put them all in the right order again.” But I’m busy right now, I can do it the next time before I use them. But not now. After all, I already had five conversations in Spanish today with the residents at the guesthouse, who are almost all Mexican. 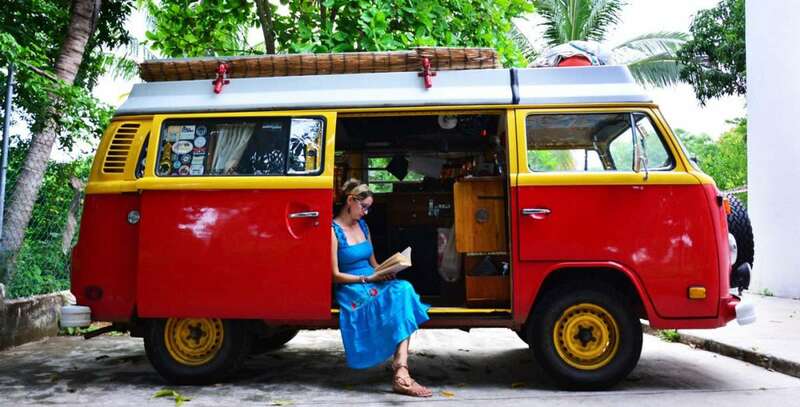 Qué está en la Kombi? What’s in the Bus? After we left Guadalajara, we spent most of our time traveling, busy, traversing Mexico to get to its southern coast on time to intersect my parents, who were flying in for a precious visit. Of course, we talk to many Mexicans on the way, but most of all I talk to Sven. And most of the time we talk in English, with a little bit of German mixed in, the two languages we are both most comfortable with. So much for Spanish immersion. When we get to Puerto Escondido and my parents arrive, it doesn’t get better. They don’t even speak three words of Spanish. I use my skills in restaurants to order tacos and tlayudas. But I don’t want to learn Spanish to be able to order at restaurants. I want to learn it to talk about politics, and cultural values, and Mexican traditions rooted in turbulent revolutionary history. We decide to stay here for a month. Puerto Escondido seems like a nice town. Sure, it has some gringos, but they are mostly people who have decided to build big gringo beach houses here like the one my parents rented, or surfers coming for the waves. The tourist infrastructure is minimal, and nothing like what plagued us on Baja. It’s a good place to spend a month in an apartment and enjoy the tropical weather and the extra time off of wheels and on the Internet. We go to the Airbnb that we want to rent for the month to meet the owners and take a look at the apartment. It is nice, and has a beautiful, tropical, turquoise-colored floor. The owners speak Spanish and Sven talks to them while I hover in the background. My skills are a little rusty, so I don’t say a lot. I didn’t understand what he said about the Internet. Sven turns to me, and translates to English, “He said we can upgrade the Wi-Fi for a few hundred pesos if it isn’t fast enough.” I’ve understood, but that rock sinks deeper and deeper into my stomach as I am disappointed with my willingness to let this conversation become ever-more Englishy. The owners switch languages to help me understand better, and I don’t contradict them. After all, now is not the time to criticize. We share the apartment with two of the best friends we have made on the road, who are also on the way to Argentina. Our common language is English. I spend most of my time here working and all of my work is in English. Immersion. What was that again? Wasn’t I supposed to be speaking Spanish? What happened to that feeling of elation, that beauty that I would see molding my words to new situations? Where did that go? I feel like it’s been ages since we’ve seen each other. I guess it’s normal. It’s the same for exchange students when they go somewhere for a year during high school or college. The year starts out with extreme enthusiasm, and it is amazing to be in a new place, even though the language is hard. But then it levels out, or even drops down to record lows, as newness becomes normalness and novelty wears off. When you realize that learning a language is like trudging through mud. That it requires constant discipline, effort, and time. I was in that stage where I would have to force myself to keep going. To speak in Spanish despite my roommates. That I had to take the book off the shelf, and dust it off. Emma sitting in the living room, dining room, study, kitchen, and bedroom of our Bus, “Big Emma”. With my new resolution, I begin to practice. A little every day, bit by bit, poco a poco. Baby steps. One night we go out to dinner with friends we have met here. They speak to each other in Spanish, and this time, I insist. At first, I’m shy, and can’t find the words. But after a while, the rhythm comes back. Reviewing my words has helped. I remember how much fun it is to spend a whole evening speaking bad Spanish and participating in the conversation despite it. We talk about my work, and visiting the city of Merida, and our friends’ new puppy. I ask Sven to translate the things I haven’t understood into Simple Spanish, and I can hold my own. Partway through the conversation, our friend turns to me and says, “Tú hablas mucho Español. Necesitas un pocito de practica, pero es bueno.” And he was right. I do speak a lot of Spanish, for the time I have been learning. All I need is a bit of time to get the ball rolling. But with no fear and a lot of determination, I’ll get the hang of this. Immersion is amazing, but conversation alone is not enough. It takes diligence. If I relied solely on conversation and my listening skills to learn this language, I would flounder into the patterns of the language that I knew already, without expanding to learn more. Not only do I need to keep talking, it is a necessity to keep studying as well. There are no more excuses. Fourteen countries. That’s how many I have in front of me. Fourteen Spanish-speaking countries until we get to the end of the road in southern Argentina. That’s how much time I have to reach my goal. A slump is not a slump forever, and the determination that filled my hours at the beginning of Latin America is still there, it is just a little tired. It is time to wake it up and get to work. Yo puedo aprender Español.